Ex-Blockheads Julia and Sasha are amongst our favourite contestants ever – not only are they a sweet couple, but their style and renovation skills are something to behold! Since their season of The Block in 2016 they’ve been keen to find a new project to flip for themselves, and they recently landed on a real beauty. Julia and Sasha bought a 100-year old Edwardian cottage full of charm which they affectionately named Little Willow. Coincidentally, the house is located just a few streets away from last year’s Block houses in Elsternwick, Melbourne. Their vision for Little Willow was to be in keeping with their design aesthetic of classic meets contemporary, with a luxe vibe. Being located within a Jewish locale meant that they wanted to keep it classic enough to suit the demographic, whilst also having contemporary appeal. Since it is a flip project, the aim was to make it as attractive as possible to the widest range of buyers in order to have the best chance come auction day. With that goal in mind, Julia and Sasha came to Freedom Kitchens to help them create the heart of this Little Willow home. Read on to see what went into the design of this glamorous Hamptons style kitchen, and you’re bound to be inspired for your own dream kitchen project. One of Julia and Sasha’s favourite features in their new kitchen are our SIERRA profile cabinets in MATT WHITE. They chose to take the upper run sky-high with tall 1250mm cabinets, creating a sense of grandeur plus vast amounts of storage. When it came to appliances, Julia and Sasha went for an impressive oven stack from NEFF which includes an in-built Coffee Machine, Compact Oven with Microwave, Slide & Hide Combi-Steam Oven, and Slide & Hide Vario-Steam Oven. These sit perfectly within the surrounding Sierra joinery from Freedom Kitchens, combining a classic cabinetry look with high end cooking technology. For ultimate seamlessness, the fridge is completely integrated and concealed, with these cabinet doors featuring large gold handles for luxe functionality. The island features a dishwasher integrated into more joinery, and the benchtop includes a large double sink – perfect for looking out into the living areas whilst prepping and washing. A gold gooseneck tap matches the integrated fridge cabinet handles, adding to the glamour. Love the white benchtop with subtle grey veining? 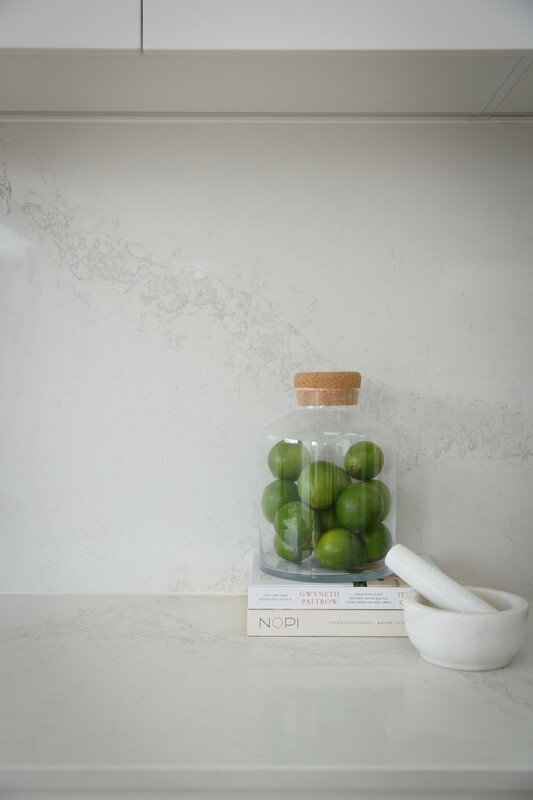 The colour chosen by Julia and Sasha is Caesarstone®’s CALACATTA NUVO, which mimics natural marble but is much more durable – not to mention more affordable. 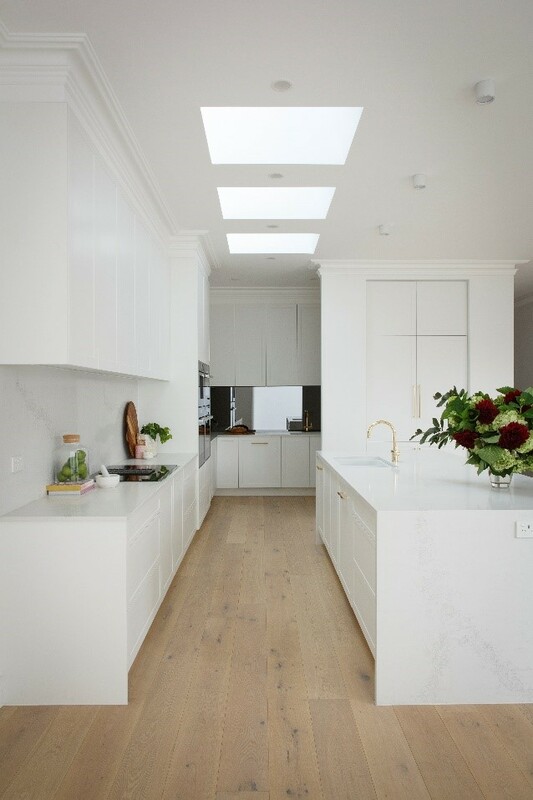 Which comes in handy when you’re using generous amounts of slabs like the ladies did, adding luxe waterfall edging on the island and also using it for the splashback. Plenty of drawers for easy access was important to Julia and Sasha, so Freedom Kitchens made sure the design included an ample amount for pots and pans. We also added in some nifty storage solutions like cutlery dividers, a walnut knife holder, and a dedicated spice drawer next to the stove top. When you venture beyond the beautiful kitchen, there’s a satisfying sense of continuity from room to room, with the butler’s pantry, laundry and mudroom all featuring the same SIERRA Shaker cabinets throughout. The open butler’s pantry reflects the style of the main kitchen space, but a smoked mirror splashback breaks up the white with some surprise drama. Like all mirrors, it helps to make the space feel larger, but the smoke effect is more contemporary than a regular mirror. 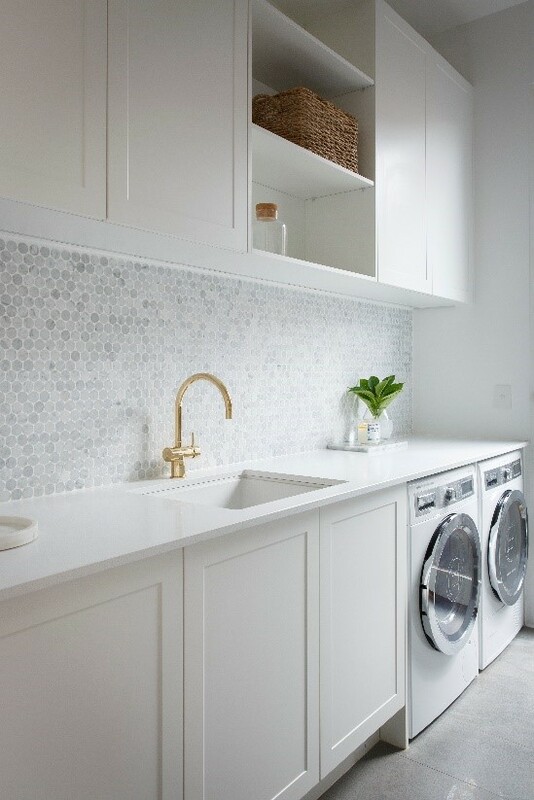 Julia and Sasha’s laundry again echoes the style of the kitchen with its cabinetry, but the use of penny round marble tiling on the splashback provides a point of difference. Some open shelving by Freedom Kitchens keep the space light and airy, as well as stylish and functional. 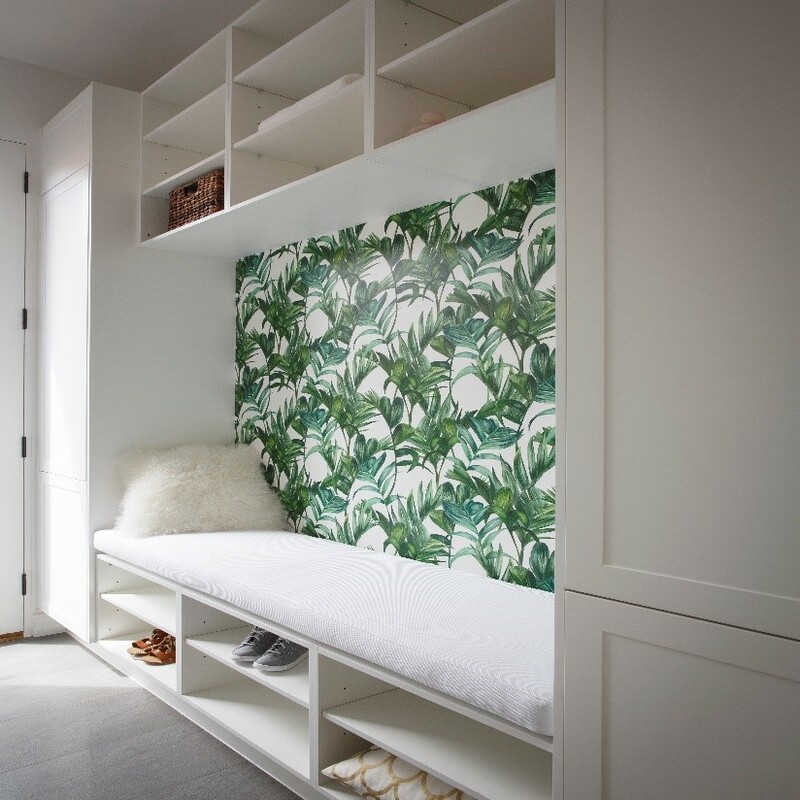 The mudroom is Sasha’s pet project – although Julia got her way with the tropical wallpaper! The very cute and useful space is accessed from outside, and features a bench to sit down to remove shoes rather than trailing dirt through the house. The open shelves underneath the bench makes the perfect place to store them. As proclaimed by Julia herself, of the four kitchens and laundries they’ve created, these are her absolute favourites – and we can see why. Julia and Sasha have made all-white white-hot, and a glamorous Hamptons style kitchen doesn’t get much better than this striking example at Little Willow. Can’t get enough of this kitchen? Watch our video below of when Sarah from The Block Shop popped in to visit Julia & Sasha’s kitchen and chat about the stunning results. You can also read more about Julia and Sasha’s renovation experience with Freedom Kitchens and the entire kitchen, laundry and mudroom reveal over at The Interiors Addict. Get started on your own renovation journey and create your dream kitchen with Freedom Kitchens today!